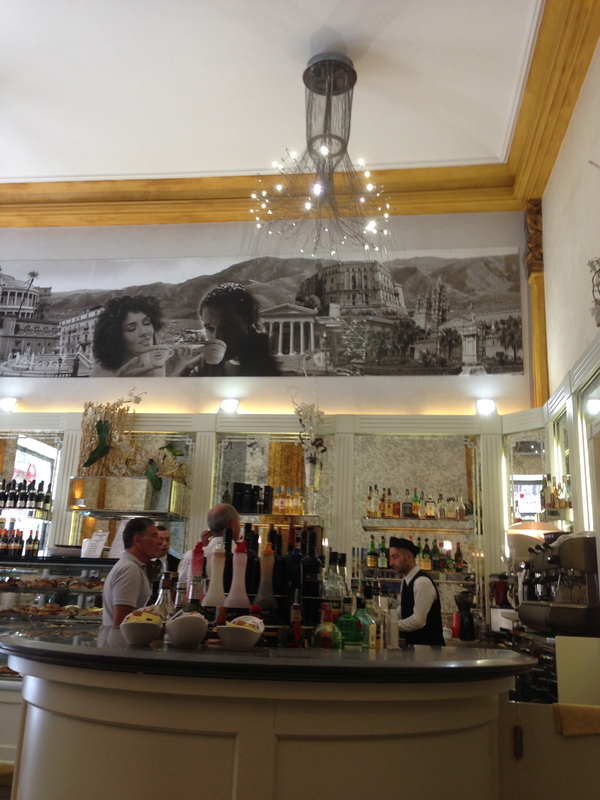 We spent two weeks in Sicily last month, for a long-awaited and much-anticipated luna di miele (honeymoon). A hundred or so years ago, my ancestors left Palermo, Messina, and Campania (Naples) for the States. After many visits to Italy, including a year studying in Florence, this was my first trip to Sicily–finally. I’m already scheming a return trip with the kids next year. I took tons of food photos; here are a few to chew on. The cheapest food in the most out-of-the-way places (where the locals or the bus drivers and boat captains told us to eat) was often better than (or just as good as) the most expensive restaurants. No surprise there, right? And so are cannoli, and ice cream…legend has it that gelato was invented in ancient times, using the snows from Mt. Etna. Hopefully it was clean snow. At Touring Cafe, we entered, joking to the waiter that we were starving, and ordered coffees, bottled water, and vino. We ate several dishes, and the total bill was only 25 euros. Coming from ultra-expensive Zurich the day before, we were jubilant to see such a tiny number on the check. 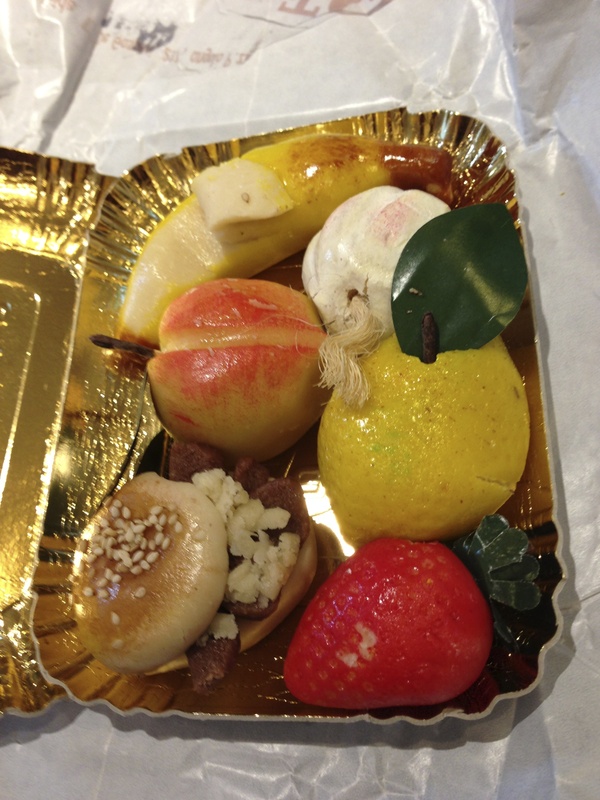 Hooray for Sicily! I’m not sure how true the chef-fisherman story is, but I believe the line about the no-fish-touches-ice-in-this-place. Maybe he’s up obscenely early to buy it from the guys off the dock. 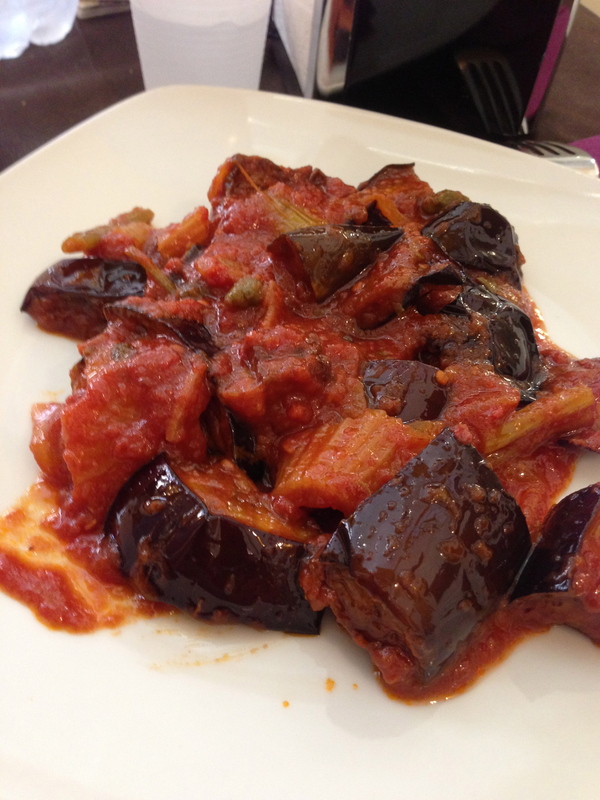 Eggplant is another Sicilian staple. 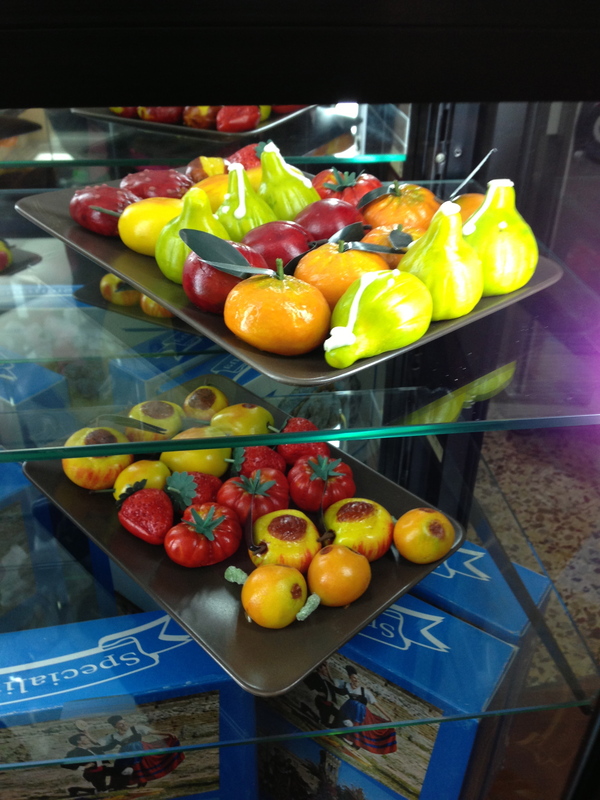 Every place seems to have its own version of caponata. Some have slivers of almonds and currents; some have carrots, olives, capers, and fennel…all are intensely flavorful, and are a nice option if you’re not a big meat eater. We didn’t eat red meat or chicken at all while we were there–just gloriously fresh fish, something this New England woman totally appreciates. yum! that’s good. 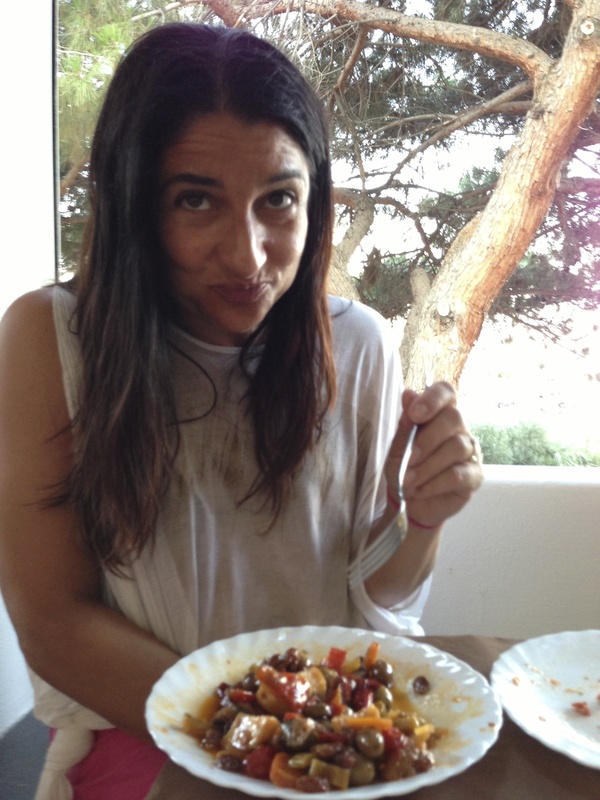 Eggplant caponata after a blissful day swimming, island of Salina. 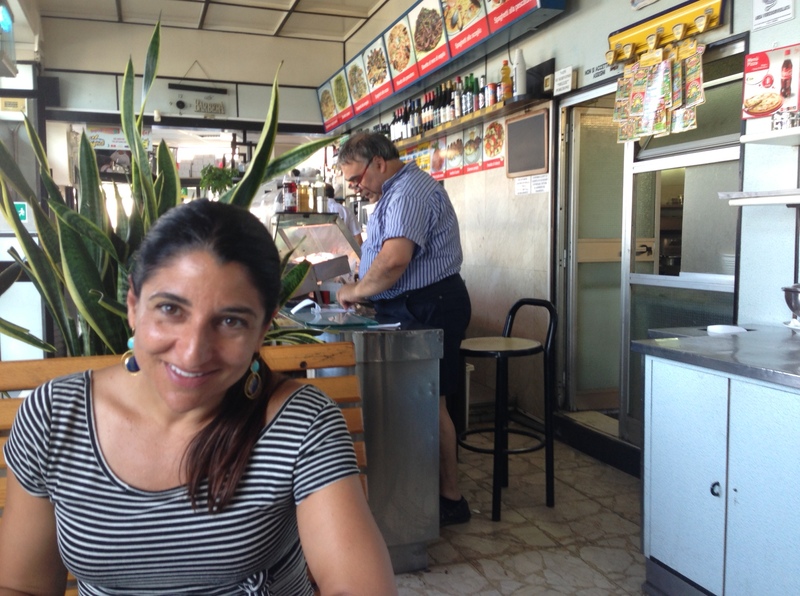 The best eggplant Parmesan we’ve ever had was in a tiny place behind the train station in Messina. It was so awesome I ordered it twice. Here’s a photo below of the place the ferry guy told us about. That’s the owner in the background. He and his son were very friendly, and spent a few minutes chatting with us. He asked me if I was in Messina to find my relatives. Not this time, I said, sadly. I thought about my ancestors, and how much they must have struggled, before and after they left Italy. I felt grateful to them for risking everything to go to America, and for me to be back, decades later, as a frequent visitor. I’ll write more about our adventures very soon. Thank you Ms. Bruni. Beautiful post. 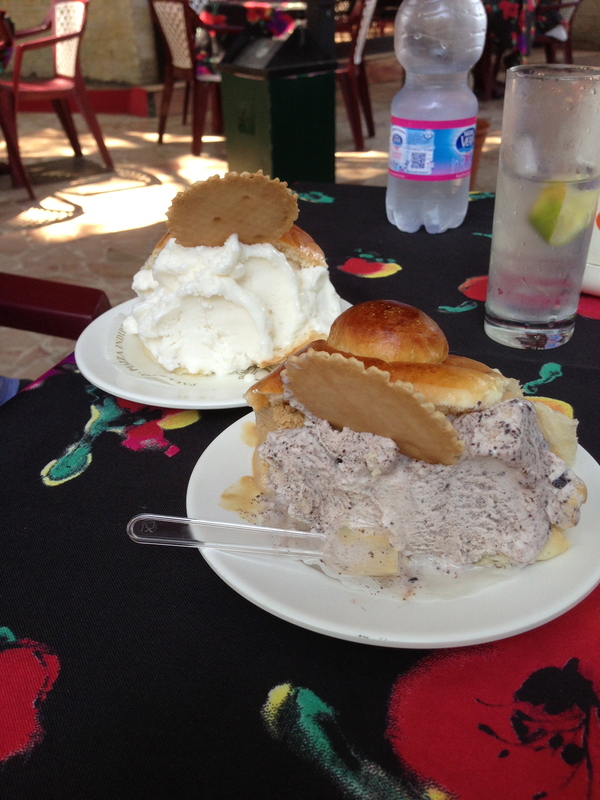 I cannot get over the size of the gelato in brioche. That would be a National Enquirer-worthy baby’s head! Anne Marie told me to take a look at your blog—I am glad I did since each photo brings back great memories. Thanks for sharing! Gosh I don’t think I’ve ever eaten seafood that hasn’t touched ice…sounds like a fabulous place to indulge in the simple pleasures of life. 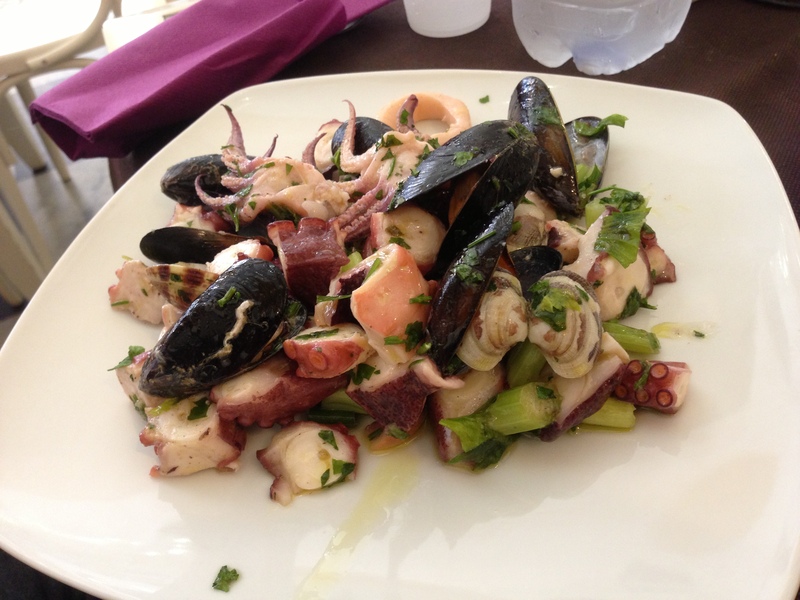 My mouth is watering after viewing the sea food and the eggplant caponata!I want to go there right now! Tasting Scott’s dishes was almost like being there. I wish I could have frozen and brought a suitcase full of eggplant parm from that little restaurant in Messina back with us. We finally looked at our photos from our trip last night with the kids. I want to go back!